So the PiTiVi announced the PiTiVi fundraising campaign on Friday. I sincerely hope they are successful, because I think we really need a good non-linear video editor that runs on the Linux desktop, especially one that is built on top of GStreamer and thus sharing the core multimedia infrastructure of the rest of your desktop. The current PiTiVi team got the right skills and enthusiams in my view to truly pull this off, and their project is scoped in a manner that makes me believe they can pull it off. PiTiVi is already functional and this fundraiser is more about accelerating ongoing development as opposed to creating something from scratch. And their funding requirements for reaching the base milestone is rather modest, for example if just the employees of the 3 main linux distribution companies pitched in 3-4 Euro it would be enough to cover the base funding goal. But I think this fundraiser is important also beyond the PiTiVi project, because it can serve as a precedent that it is possible to do significant crowdfunding around open source development and thus open the gate for more projects accelerating their development using it. There are a lot of great open source projects out there created on a volunteer basis, which is great and like PiTiVi they will flourish even without crowdfunding, but crowdfunding can be a great way for developers of the most interesting projects to be able to focus solely on their project for some time and thus accelerate its development significantly. So in the case of PiTiVi, I am sure the team will be able to achieve all the goals they have outlined in the funding campaign even if the fundraiser raises no money, but the difference here is if they do it in 1 year or 5 years. So personally I donated 60 Euro to the PiTiVi fundraiser and I hope everyone reading this blog entry will do the same. Lets give the people developing this and other great open source tools our support and help them make their great software even better. This fundraiser is done by people passionate about open source and their project, because to be fair, no matter if the efforts ends up raising closer to 30 000€ or closer to 100 000 € it is in no way what anyone can call a get rich quick scheme, but rather modest amounts that will let two talented open source developers spend time working fulltime on a project we all want. And remember whenever a major project using GStreamer gets a boost, it gives all GStreamer projects a boost. For instance in my own pet project, Transmageddon, I am gotten a lot of help over the years from general improvements in GStreamer done due to the involvement from PiTiVi developers, and I have even ended up copying code from PiTiVi itself a few times to quickly and easily solve some challenges in had in Transmageddon. So thanks to the new GStreamer 1.x VAAPI package for Fedora I was able to do a hardware encode with Transmageddon for the first time today. This has been working in theory for a while, but due to me migrating Transmageddon from GStreamer 0.10.x to GStreamer 1.x at the wrong time compared to the gstreamer-vaapi development timeline I wasn’t able to test it before. Bellow is the GStreamer pipeline that Transmageddon use now if you have the Intel hardware encoder packages installed. Click on the image for the full image. 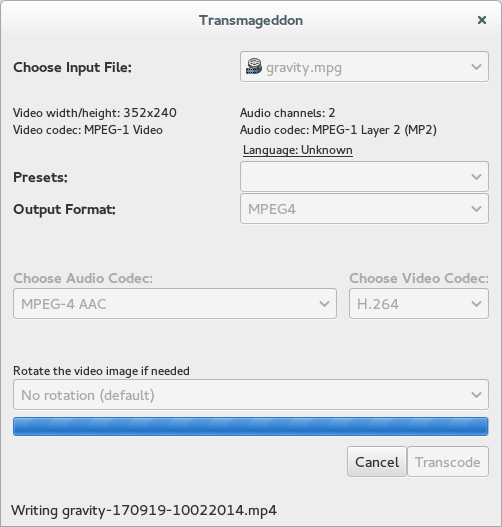 I am also close to being able to release the new version of Transmageddon now. Most recent bugs found have turned out to be in various GStreamer elements, so I am starting to feel confident about the current pipeline building code in Transmageddon. I think that during the GStreamer Hackfest in Munich next Month I will make the new release with the nice new features such as general support for multiple audio streams, DVD ripping support and language tag setting support. So we had the DevConf conference here in Brno this weekend. One of the projects I am really excited about is Cockpit. Cockpit is a new server administration tool developed by Red Hat engineers which aims at providing a modern looking and userfriendly interface for your servers. There has been many such efforts over the years, but what I feel makes this one special is that it got graphical designers and interface designers involved, to ensure that the user experience is kept in focus instead of being taken hostage by underlaying APIs or systems. Too many such interfaces, be they web based or not tend to both feel and look clunky, for instance sometimes exposing features not because anyone realistically ever would want them, but because the underlying library happen to have a call for it. Cockpit should also hopefully put the final nail in the coffin for the so called ‘server desktop’. The idea that you need to be able to run a graphical shell using X on your server adds a lot of pain with little gain in my opinion. The Fedora Server product should hopefully become a great showpiece for how nice a Linux server can be to use and configure when you have something like Cockpit available. There was some nice videos showing what is already in Cockpit shown at the conference so hopefully they will be available online soon. In the meantime I recommend taking a look at the Cockpit web page.